I’ve made this leek and chickpea soup twice in the past week. The first time at the weekend because my partner fancied soup with chickpeas in it which reminded me of this recipe; the second time yesterday because I’d been reminded at the weekend how much I love it! I’ve started to notice a theme that runs through the soups I share. When I sit down to write about them the words cheap, easy and tasty come to mind. So yes this, like my recipes for Frugal Lentil Soup, Cream Of Celeriac Soup and Magic Soup, is cheap, easy and tasty. I make the more traditional leek and potato soup quite often but this is even quicker and less effort because you don’t have to prepare the potatoes or wait for them to cook. It was inspired by Jamie Oliver’s recipe for chickpea and leek soup in his first ever book, The Naked Chef (17 years ago now!). His recipe is pretty simple but my version is even simpler. Unlike Jamie, I don’t include potato and tend to use canned chickpeas, but use chickpeas you’ve cooked from scratch if you prefer. I keep envisaging a time when I’ll cook up big batches of dried pulses and freeze them in portions but I haven’t reached that pinnacle of domestic goddess-ness yet! You can leave the soup chunky or blend it smooth but I like to follow Jamie’s suggestion of blending about half so you get a creamy soup base with some whole chickpeas and bits of leek. I love the flavour and purity of this leek and chickpea soup just as it is but you can sprinkle it with grated Italian-style hard cheese (something like Parmesan but vegetarian) and/or drizzle it with some extra virgin olive oil if you want to. Without these trimmings it reminds me of the Alice Waters quote I shared in last week’s newsletter: “Let things taste of what they are.” Sometimes I want a recipe to transform the ingredients into something that’s greater than the sum of the parts but at other times I just want to enjoy the individual ingredients. 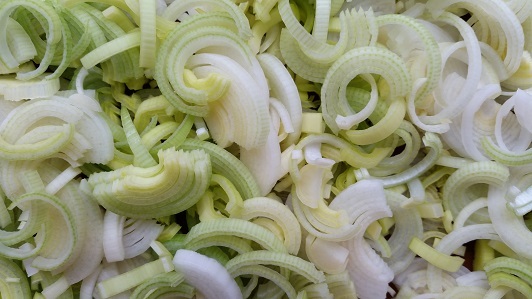 Trim the leeks, halve them lengthways and finely slice. Rinse them thoroughly because they often have bits of soil between the layers. Warm the olive oil in a large saucepan and fry the leeks and garlic gently for 10-15 minutes with the lid on, to soften without colouring. 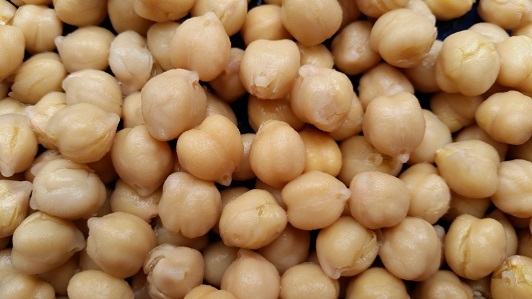 Drain the chickpeas and add them to the pan with the vegetable stock. Take about half the soup out of the pan and blend it carefully (it's hot!). Return the blended soup to the unblended soup in the pan, stir well and bring back to the boil. Serve with freshly ground black pepper. Looks yummy. I love chickpeas, leeks and I love soup. Will give this a try. I love all those things too Ber and this is a very easy way of putting them all together 🙂 Thanks for stopping by. I’ve never thought of putting chickpeas and leeks together, but I’ll certainly try now!